This edition of TIA E-News is packed with great resources: the Global Corruption Barometer results, the Options Paper for Australia’s national integrity framework, TI’s new report Exporting Corruption and much more! Australians’ trust in government has continued to slide, driven by growing concerns about corruption at the federal level, according to a special Global Corruption Barometer (GCB) survey conducted by Griffith University and Transparency International Australia. 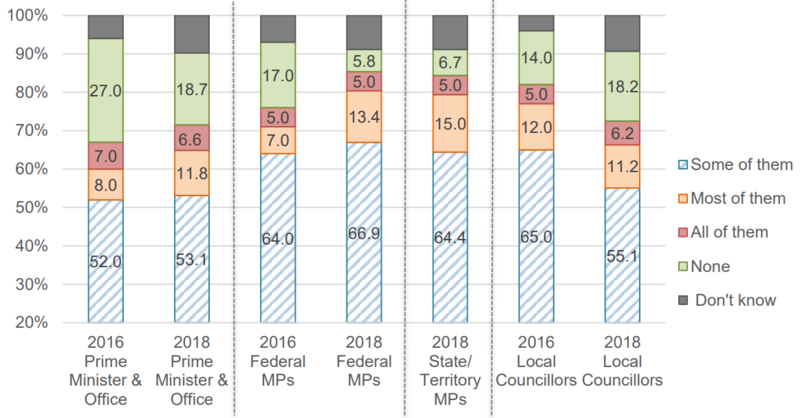 A 9 point increase since 2016 in perceptions that federal members of parliament are corrupt (85% at least ‘some’ corrupt, 18% ‘most/all’ corrupt) – placing them on par with state parliamentarians and worse than local officials. Project leader and TI Board member Professor AJ Brown, said the results provide both a warning and an opportunity for Australian governments. “Well over a third of citizens’ total trust and confidence is now explained by whether they feel the government is doing a ‘good job in fighting corruption’ (37% at the federal level, 25% state). Read the full press release here, along with more date. Right on the heels of the Global Corruption Barometer survey, this new discussion paper by TIA Board member AJ Brown and colleagues provides some real solutions to the problems raised in our community survey. TIA’s CEO Serena Lillywhite warmly welcomes this important piece of research, as it provides a clearer path forward to tackle corruption. Among the options presented in the paper, TIA’s preference goes to number three: a custom built agency with broad powers. Read the full report, summary and TIA CEO’s response through the links below. Transparency International Australia’s 2019 national conference – Tackling Corruption Together — will set the stage for the private sector to champion and demonstrate a pro-integrity course of action. Hear from experts, regulators, and business leaders from the financial, mining, real estate legal and accounting sectors, as to how they are responding to integrity and corruption challenges. Meet Transparency International’s dynamic global chairperson, Delia Ferreira-Rubio of Argentina, hosts of the latest G20 Summit, and better understand the world trends affecting Australia’s anti-corruption fight. 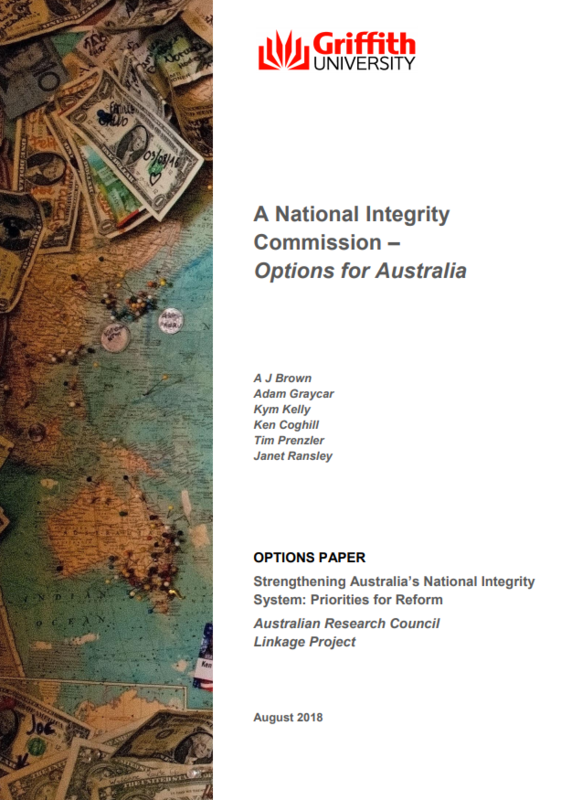 Learn what Australia can and should be doing to lift its game, through the findings from of our major 2-year National Integrity System Assessment. The Conference takes place on Thursday 4 April in Melbourne and is preceded by a half-day National Integrity Workshop on Wednesday 3 April. The Global Corruption Barometer results gathered a lot of attention in the media, with stories on ABC News (20 Aug), ABC Radio (20 Aug), The Australian (20 Aug), The Guardian (21 Aug), The Conversation (27 Aug) and The Mercury (20 Aug). AJ Brown discussed transparency in Australian politics on Late Night Live on 17 September and commented on “Au Pairs” Inquiry and the need for a federal integrity systems reform for the Mandarin on 20 Sep.
A new Queensland mining and gas rehabilitation fund will force resource companies to contribute into a pool of money to be used for rehabilitation for abandoned sites but the amounts will remain secret as the QLD Government is seeking to change the Right to Information Act to block the release of that information, along with how risky projects are. TIA’s Serena Lillywhite commented on ABC News and Nine News how the Government appears to have been influenced by industry into a decision that is not necessarily in the public interest. Exemptions to the Right to Information Act are usually limited to information relating to intelligence, police operations or personal details. 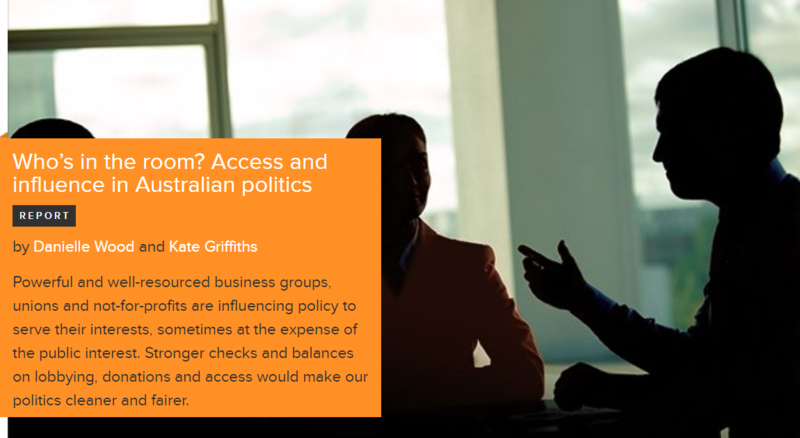 Read the Grattan Institute’s great new report on access and influence in Australian politics here. The report reinforces the calls TIA has long made: we need an independent federal anti-corruption and integrity agency with the powers to investigate, including breaches of the federal Code of Conduct, and greater checks and balances against unfair influence. TI’s new report Exporting Corruption assesses the enforcement of the OECD’s Anti-Bribery Convention in 2018. 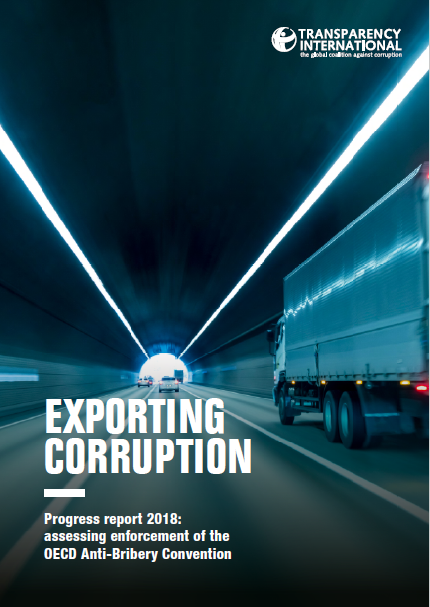 This 12th edition of the report finds that “Only about a quarter of world exports come from countries with active law enforcement against companies bribing abroad.” You can find the full Exporting Corruption report on our website with other interesting TI reports. 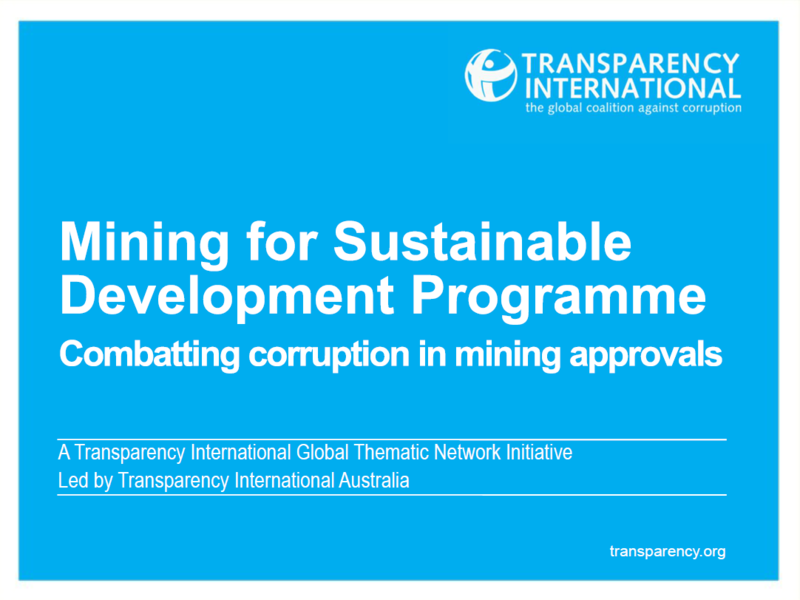 During the past couple of months, TIA has organised a series of briefings on the Mining for Sustainable Development program our chapter is leading for the global TI movement. 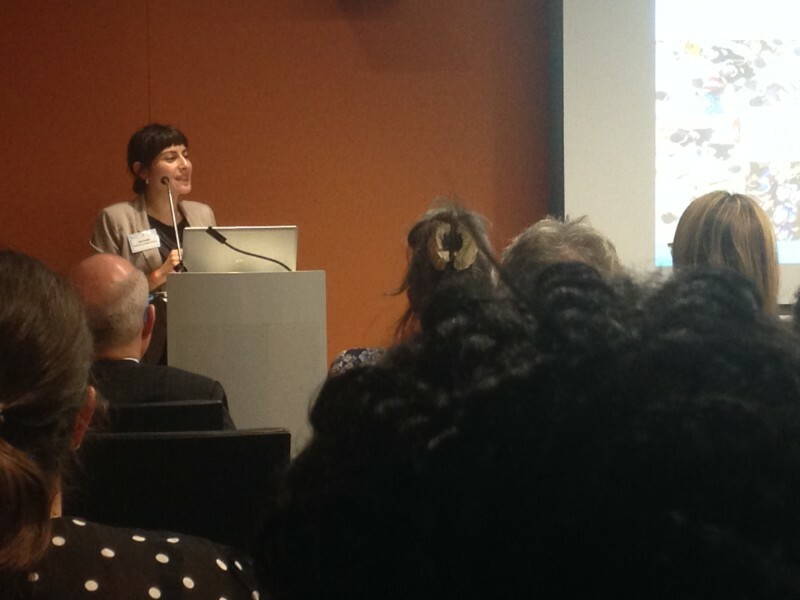 You can find our Research Manager Lisa Caripis’ presentation on the program by clicking the picture below. On 17 September The Guardian launched the Transparency Project, a one-stop collection of government transparency tools and investigative news stories on corruption and political accountability. 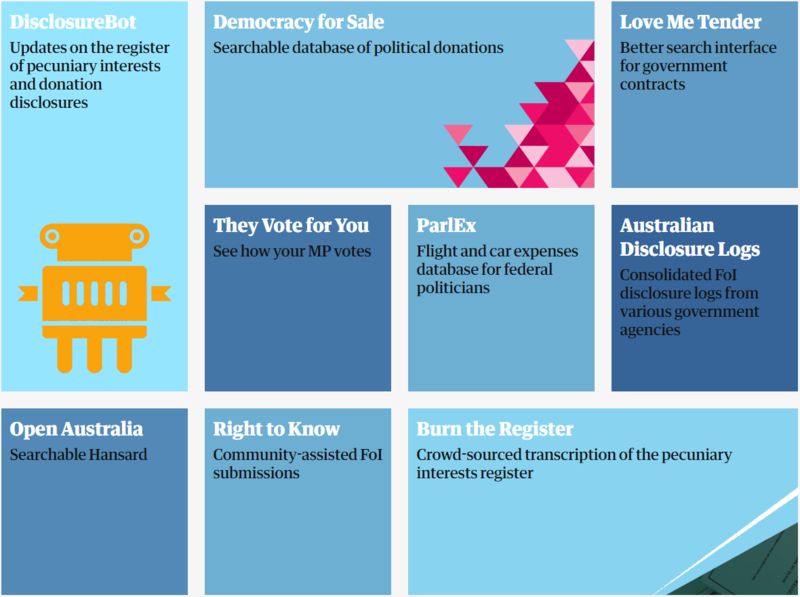 TIA strongly suggest you bookmark this page, which is full of interesting content – start exploring with this feature story on Australia’s lobbying regime with commentary from TIA’s AJ Brown and Serena Lillywhite. Our colleagues at Global Witness have recently produced two excellent resources: Finding the Missing Millions is your step-by-step handbook for following the money and holding governments and companies to account for extractive industry revenues. The handbook is accompanied by video tutorials tha you can find here. The Companies We Keep is another fine piece of research by Global Witness. It is the first in-depth analysis of the beneficial ownership data in the UK. Because the data is provided in an open format, Global Witness was able to identify loopholes, information gaps and suspicious activity across the whole register in an unprecedented manner. The strengths and weaknesses of the UK register are a valuable source of information for countries such as Australia that are debating on the introduction and the design of a similar register. 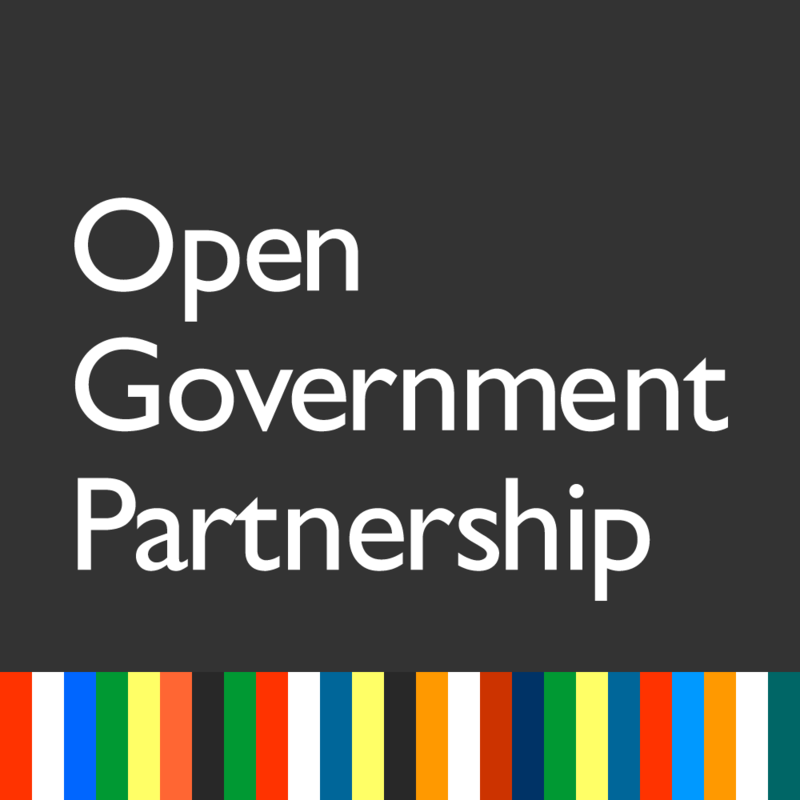 The Australian Government has released the second Open Government National Action Plan 2018-20, which is accessible here. The plan builds on the first national action plan that expires this year. Progress has been made on a number of the priorities in the first National Action Plan. Many of the first National Action Plan commitments are on track, others delayed – namely whistle-blower protection, the EITI and Beneficial Ownership. Over the course of the second National Action Plan we need to see high level government leadership, better support for the work of the civil society members in reaching out to their networks, and improvement in the depth and breadth of consultation and communication with a broad cross-section of civil society. There are a number of areas of importance that are not included in the second plan. These include ongoing work on open contracting, access to and management of information, implementing the Sustainable Development Goals, addressing business and human rights responsibilities, and establishing a national integrity commission. These ideas should become solid commitments that are ambitious, transformative and coherent in future plans. The new NAP also means a new Open Government Forum, the body monitoring the implementation of the new plan and developing the next one. The nomination period is now open and closes on Friday 12 October 2018. Find more information here.